The Harris TB9300 is a powerful DMR Digital and Analog repeater that can be mounted on a standard 19 inch rack. With dimensions of 19 x 7 x 15.8 (WxHxD) and a continuous power rating of 50W or 100W available in VHF & UHF, clarity and range will not be an issue. The TB9300‘s Wide frequency range 400-440Mhz , 440-480Mhz, 760-870Mhz in UHF and 148-174Mhz VHF bands allow 1000 channels of FEDERAL and Commercial frequencies to be programmed. The TB9300 can be programmed to emit as little as 5 watts when low power is required. The TB9300 repeater is available with an internal Duplexer. Its internal power supply is designed to work with 110-240V AC and/or 12,24,48Vdc. Allows 2 conversations on one RF channel, increasing its functionality and reducing cost. Auto switches between DMR Digital mode II and Digital Mode III for trunking and conventional repeater modes permitting easy migration from Analog to Digital. IP connects to other units across the world. Includes imbedded data for location services. Allows for customer specific applications. Alarm monitoring of up to 12 parameters. Allows for remote programming and software uploads reduces the need to visit the repeater site for upgrades. Has built in Audit and system logs permitting service technicians to review the units operation over the past few days and not just its immediate cycle. LCD display on the front panel allows on site technicians to view every feature and function for proper operation. The LCD can also be disabled to prevent vital information from being obtained. Available in dual 50W transmitter mode for those sites where 100% up time is required. DTMF Telephone Interconnect is also available using the rear accessory port utilizing a DMR Network Gateway. Allows analog mode with the ability to decode CDCDSS/CTCSS codes. 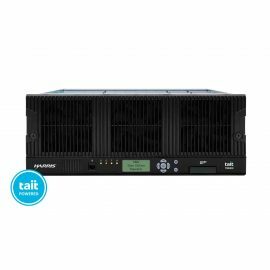 The TB9300 ‘s compact size, features and ruggedness offers Federal agencies, hospitality, shopping centers, security, schools, maintenance and construction a fully featured repeater that can be easily upgraded from single repeater site coverage to multiple repeater site coverage via IP. TheTB9300 is covered by a standard 2 year Manufacturer’s warranty.